Be sure to give Ted Cruz a sarcastic thank-you, because the U.S. has a surgeon general for the first time since July 2013 owing to his attempt to block the president’s immigration order. 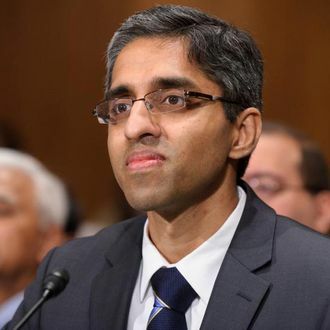 The Texas senator’s maneuvering helped Democrats advance many of Obama’s executive-branch nominees over the weekend, including that of Dr. Vivek Murthy for surgeon general. On Monday night, he was confirmed in the Senate by a vote of 51 to 43, despite unlikely opposition from the National Rifle Association. Generally the NRA does not concern itself with public health issues, but the organization managed to hold up Murthy’s confirmation over comments he made in support of gun control. Doctors for America, a group Murthy co-founded, sent a letter to members of Congress one month after the Newtown massacre. It called for a federal ban on the sale of assault weapons, universal background checks, and repealing laws that prohibit doctors from discussing gun safety with patients. “As health care professionals who are confronted with the human cost of gun violence every day, we are unwavering in our belief that strong measures to reduce gun violence must be taken immediately,” the letter said. Nevertheless, Murthy was backed by a coalition of more than 100 health-care groups, including the American Heart Association and American Public Health Association. He told a Senate nominating committee that he hopes to “marshal partnerships across the country to address the epidemics of obesity and tobacco-related disease, to reduce the crippling stigma of mental illness, to roll back the resurgence of vaccine preventable disease” rather than focusing on gun control. Rear Admiral Boris Lushniak has served as the nation’s top doctor since Surgeon General Regina Benjamin stepped down a year and a half ago. Murthy is set to serve a four-year term. Unlikely Question of the Day: Is Elizabeth Warren Essentially Ted Cruz?